I am sharing the pretty Poppystamps Stitched bloom trio dies. Instead of shaping them with a foam mat and stylus like I usually do I thought I would share a different way for those of you that may not have those tools. I took my bone folder, and while holding the middle part of the flower, so I don't rip off the petals I ran the bone folder along the bottom part of the petal to give it that curve, kind of like how you do when you want to curl ribbon. If you don't have one of those either you could use a Popsicle stick or maybe a small paint brush handle. Stickles in Starry night were added to the center of the flowers. 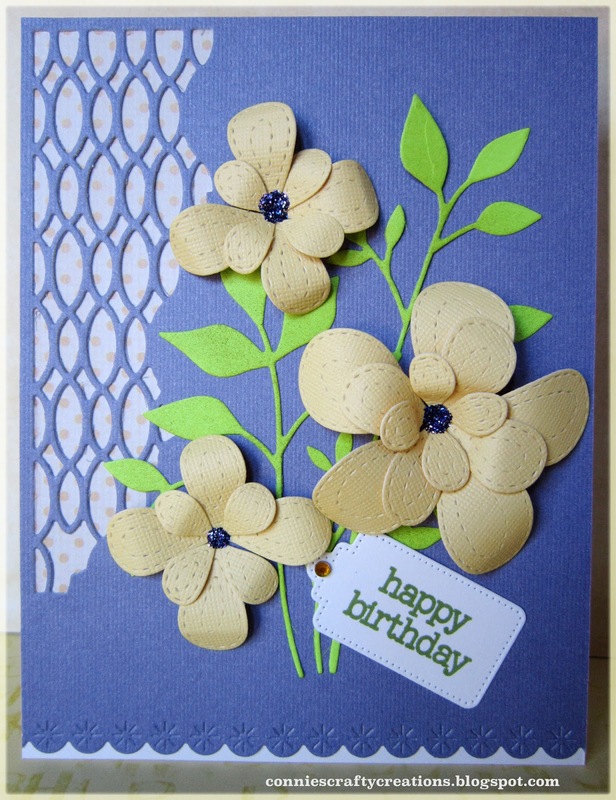 For the big flower I used all three die and layered them together for two of them I used only the two smaller dies. Next I cute my cardstock at 4 1/4 x 5 1/2 inches and taped the Poppystamps - Tulisa Corner collage die to the upper left hand corner and cut it out, I then added a piece of scrap paper I had to the back before applying it to my card base. 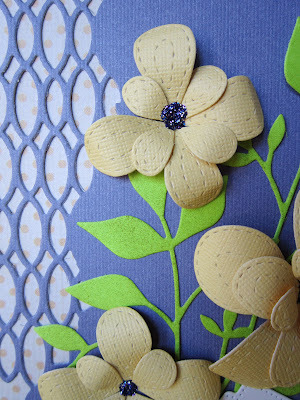 I just love the style of that corner and you can see the stitched flowers here also! Next I cut the Memory Box -- Fresh Foliage die I added a little ink to the leaves to tone down the green card stock I had. Next is the pretty Poppystamps Eyelet stitches border die, I love all the stitched borders in this die, unlike the other stitched border dies I have been using these actually cut a scallop on one side. I finished the card off with the Poppystamps Pinpoint main street tag die, all I had to do is add the little gem and sentiment. Don't forget about the Design Team Call that Dies R Us is having, find out all the details HERE. Here are the dies used in this card. Connie, I just love everything about this beautiful card! The stitched flowers are so pretty with their glittery centers and I love how you used the corner collage die and sweet lacy edge. Your card has me dreaming of spring!! LOVE the dimension you got on those fabulous flowers! 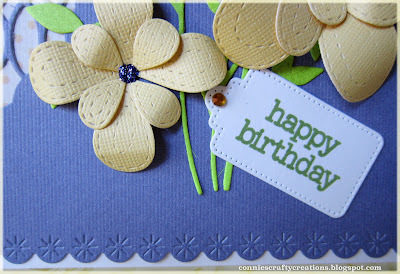 This is a beautiful card using many beautiful dies! Fantastic! The yellow flowers stand out so nicely against the pretty blue background. Love those stitched flowers. Wonderful card with tons of inspiration. the stitched flowers are delightful! great job! Hyndragea - Happy Birthday Card !